Solar trajectory. Copyright 2017 Kelvin S. do Prado under MIT License. Research in the field of environmental psychology has afforded us new insights into the relationship between the built environment and creative thinking. Among those insights is that we can improve our ability to generate novel and useful solutions to creative problems by shaping our surroundings in line with scientific findings. My goal in this article is to share techniques for maximizing creative productivity in physical space by drawing on experimental data involving the effects of light on creative processing. I’ll also examine how the practices of eminent creatives have aligned with these findings. Central to any discussion of light is the circadian rhythm. A mashup of the Latin words for “approximately” (circa) and “day” (diem), the term refers to the roughly 24-hour period it takes the earth to revolve once around its axis. 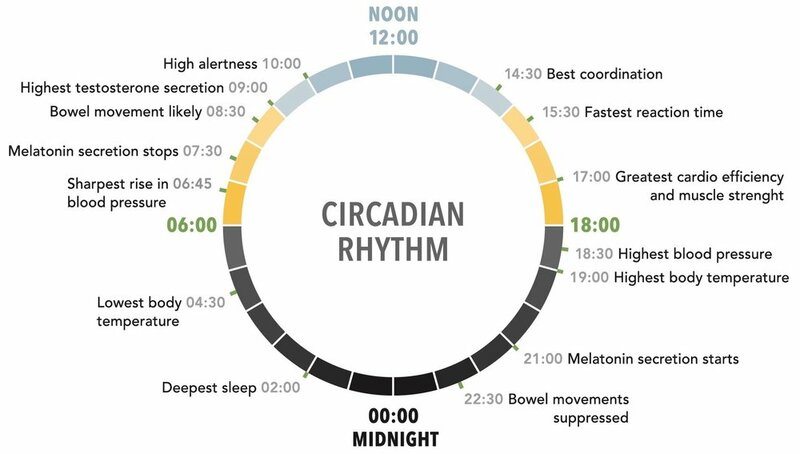 Diagram of the circadian rhythm. Illustration via Donald M. Rattner, Architect. From the book Your Creative Haven by Donald M. Rattner (Skyhorse Publishing, 2019). One obvious manifestation of this perpetual cycle is the evolving condition of the sun. At dawn, it is low on the horizon, moderate in intensity, and amber in color. By morning, the sun is on its upward trajectory, gaining brilliance, and the light becoming cooler in hue as the day wears on. That pattern is reversed after peaking at midday, until it finally disappears in a warm and sometimes even fiery blaze at nightfall. Alcove. Muharraq, Bahrain. Photography by John Grummitt. Many aspects of human physiology are biologically pegged to this period, most noticeably the internal clock that controls our sleep-wake cycle. For example, the release of the hormone melatonin, which prepares us for sleep, is triggered by the onset of darkness, whereas the cool light of morning suppresses its production, enabling us to fully awaken and become energized before the cycle repeats itself again. Other hormones ebb and flow to regulate bodily functions throughout the cycle as well. Regardless of the myth of the depressed, debauched, and destitute artist, the truth is that being at your best creatively means being at your best physiologically and psychologically. Attuning your sleep-wake cycle to the circadian rhythm is an important step in that quest. The challenge is that we are far-removed from the purely natural environments of our caveman ancestors, for whom the sun was the sole source of light and who did not spend around 90 percent of their waking hours indoors, as we do. Fortunately, there are techniques you can use to harmonize your creative space with the circadian cycle. 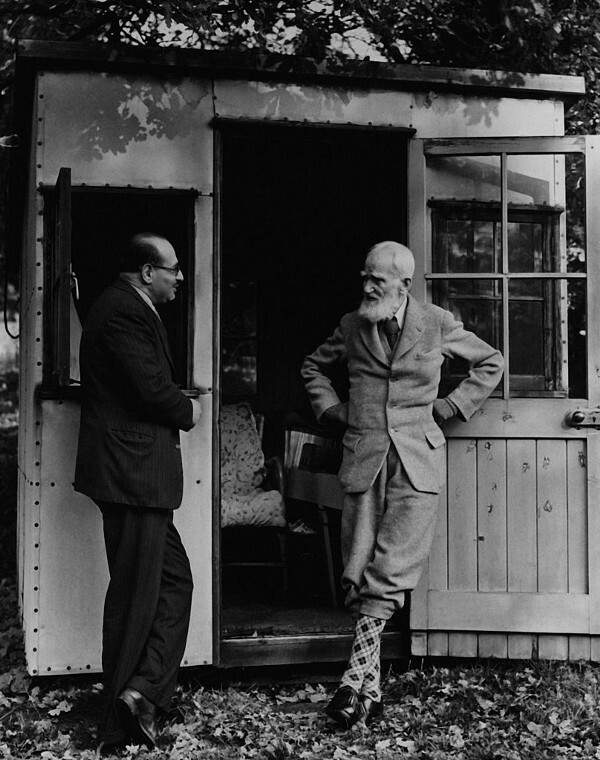 George Bernard Shaw at his writer’s shed. Photography by Getty Images. As you might expect, one of the most effective things you can do to reap the benefits of natural light is to bring it into your space. That means, first and foremost, avoiding interiors with no windows. To give you some measure of the havoc that the absence of daylight can wreak on mind and body, researchers found that people who work in windowless environments on average get 46 minutes less sleep on work nights, experience lower-quality rest, and are less physically active during the workday than colleagues who are afforded adequate exposure. If that weren’t disturbing enough, medical scientists report higher levels of depression, anxiety, delirium, and even psychosis among patients lacking access to outside views in healthcare facilities. Jakob Alt, “View from the Artist’s Studio in Alservorstadt Toward Dornbach,” 1836. In many cases, you will want to bring more natural light into your space. Here are some tips. For starters, position mirrors across from window walls to bounce whatever light does filter in back into the room. Choose pale colors throughout. Opt for higher gloss paint finishes than normally recommended.Replace solid doors with glazed units. Minimize window drapery. Steer clear of thick pile carpet and other light-sucking materials on floors and walls. Keep surfaces free of dust for maximum reflectiveness. And hang artwork evocative of the sunlit outdoors — a number of studies indicate that visual representations of eye-catching scenery can elicit the same psychological response as seeing the real thing. For the ultimate in circadian synchronization, take a page from playwright George Bernard Shaw and build yourself a freestanding studio mounted on a mechanical turntable that you can rotate with a hand crank to track the path of the sun. Of course, too much of a good thing can be bad. A work environment with excessive sunlight can result in glare, unwanted heat gain, faded materials, and other unintended consequences. If that’s an issue in your space, I suggest installing Venetian blinds, exterior awnings, landscaping, or other configurable shading devices to modulate light intensity and direction as needed. Morning light in South Australia. I presented research in the previous article indicating that exposure to the color blue improves creative task performance. This naturally leads to the question of whether working under the cool light of day will bring about a similar boost in creative problem-solving skills. At least one published paper concludes that it does. So does an abundance of historical and anecdotal evidence. Many accomplished writers, for example, favor the morning hours for exercising their powers of imagination, leaving the remainder for analytic tasks, such as proofing, copy editing, and reading. Interestingly, such an approach is consistent with findings that brain fluency shifts from so-called right-side dominance to left-side dominance over the course of the day. That said, a variety of factors are likely to play into your efforts to coordinate creative time with daylight. Some are practical: Frank Kafka, for example, was compelled to pursue his literary interests at night because of his day job as an insurance executive. Others are biological: You might be a night owl or a morning person by nature. None of this takes away from the premise that our general productivity and well-being rely on healthy intakes of natural light. Composite photograph by Donald M. Rattner, Architect. From the book Your Creative Haven by Donald M. Rattner (Skyhorse Publishing, 2019). Now let’s address the elephant in the room: electric light. First, the good news. We’re no longer constrained by the rise and fall of the sun to function at all hours of the day. The bad news? Artificial illumination can thoroughly disrupt our circadian rhythms by exposing us to blue light at all hours of the day. And not just from light bulbs. Our computer screens, mobile devices, televisions, and assorted electronic doodads all emit light in the blue spectrum. But it’s not all bad news. Ironically, technology can help us solve some of the problems that technology has wrought. Hue smart lighting system by Philips. The first step is to replace your fixed-temperature bulbs with app-controlled LED lighting products, such as the Philips Hue. With these smart systems, you can program your fixtures to mimic the color transformations and intensities of the sun in real time. Keep them set at amber at night to further minimize pattern disruption. Yes, some color-changing bulbs cost more up-front than their analog counterparts. But those costs will be offset by reduced energy bills, longer periods between product replacement, and higher productivity. When it comes to electronic devices, the best strategy for maintaining circadian rhythms is to power them off one to two hours before bedtime. Barring that, install a free program like f.lux for Macs or Windows (in beta) on your computers. These apps automatically transition your screen from its default blue to a deep amber at sunset. A similar feature, called Night Shift, is available for smartphones in both iOS and Android. Want a low-tech solution that might do the most to reduce blue light? Try donning amber colored shades after dark. Dorky never looked so good. That’s what psychologists Anna Steidel and Lioba Werth discovered when they assessed the effects of light intensity on creative insight. According to their findings, on average people exhibit a greater aptitude for solving creative problems working under relatively dim light (150 lux) than in a typical office (500 lux) or highly illuminated setting, like a television studio (1,500 lux). As for why darker is better for out-of-the-box thinking, Steidel theorizes that bright lights give people the impression they’re under surveillance, which in turn makes them feel less free to take risks for fear of criticism. I have a couple of additional theories to offer. First, I would suggest that we’re less cognizant of the boundaries of space when the surrounding walls are underlit, as they are in Diane Walker’s eloquent portrait of a young Steve Jobs. This effectively makes a space seem like it’s expanding, which in turnbroadens our receptiveness to new ideas, a cognitive phenomenon I describe at length in the opening article of this series. Besides enlarging our perception of space, low-light conditions also discourage the eye from narrowly focusing on the details of our surroundings, leaving us free to engage in the abstract, big-picture style of mental processing associated with creative thinking. Frame from Walt Disney’s “Mickey’s Birthday Party,” 1942. Take a look again at the photograph of Steve Jobs. Do you see something else in the picture that links lighting to creativity? If you guessed the standing lamp by Jobs’ side, you’re right. It’s a subtle but nonetheless credible representation of an idea bulb. As far as I‘ve been able to determine, the idea bulb originally appears as a mechanical device attached to a hat in a 1935 Betty Boop cartoon. Seven years later, another Disney production shows it floating in space, establishing the convention for how it’s rendered toda. As entertaining as studies like this one might strike us, its underlying motivation is consistent with the goal of creativity-driven design psychology in general: to find those conditions of physical space that make us happier, healthier, and more productive individuals.